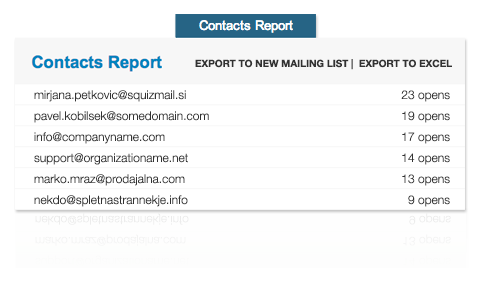 Contact report gives you detailed overview over all recipient activities. You can see exacty who open and read your email, when did they open it and how many times. You can further group recipients email addresses by actions like clicks, opens, forwards, complaints, unsubscribes, bounces and errors. Contact report is essential for any advanced analytics. And SquizMAIL fully suport it.